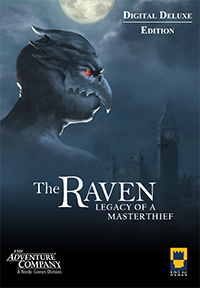 The Raven: Legacy of a Master Thief is an adventure game that was released over three chapters. It is a mystery set in the 1960's, where a detective attempts to find The Raven, an art burglar who leaves behind trademark black feathers as clues. The game was released episodically across three chapters. The first chapter was released on July 23, 2013, and the remaining two chapters were released in the following months.